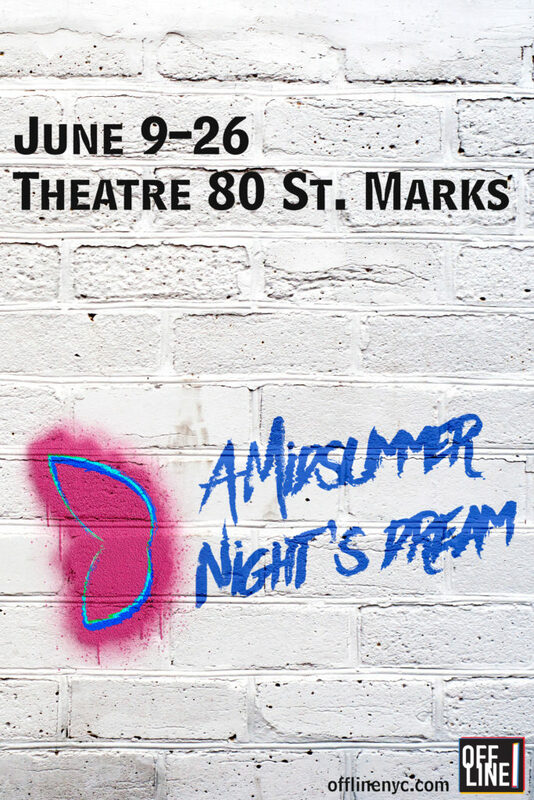 New York, NY: OFFLINE Executive Producer Demetri Kofinas and Director Alexis Confer, are proud to announce their upcoming production of A Midsummer Night’s Dream, set to open June 9th, at the historic Theatre 80 St. Marks, in the heart of New York’s East Village. Our modern take on this classic will transport audiences to the enchanted urban forest of NYC’s electrifying Lower East Side. Lines are blurred between fairy and starving artist, musician and noble lord, as we follow the interwoven storylines of four young lovers, a troupe of madcap actors and the fairies who toy with all their fates. Following in the signature OFFLINE style, the cast features a talented mix of comedians, actors, improvisers and musicians, making for a unique rendition of one of Shakespeare’s most captivating comedies. This production reinvents the Bard’s classic in an interactive, accessible and light way. It will appeal to the most avid Shakespeare fan, as well as to those experiencing a live play for the first time. We look forward to seeing you in the forest! 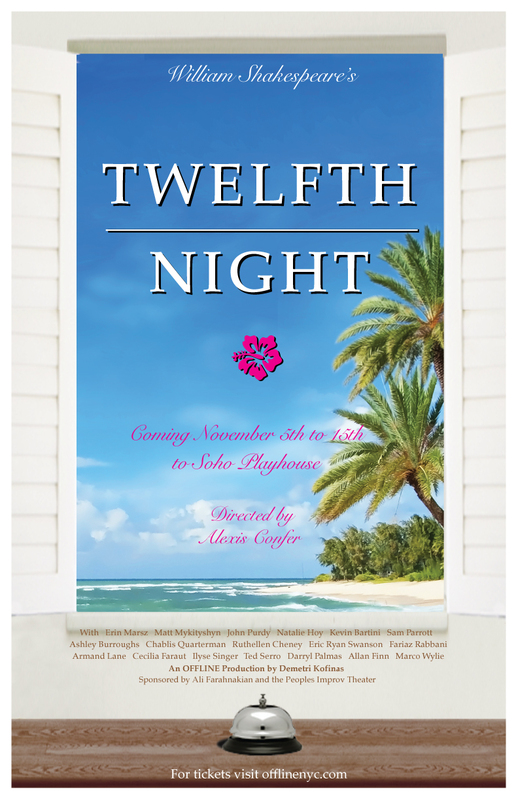 New York, NY: Offline Productions’ Executive Producer Demetri Kofinas, and Director Alexis Confer, are proud to announce their upcoming production of Twelfth Night at New York City’s historic Soho Playhouse. Twelfth Night follows the headstrong and independent Viola as she navigates the world of love, mixed identity and individualism. Keeping with the original spirit of the play, Offline Productions’ rendition transports our audience to an exotic and far-off destination: the Hawaiian beach resort of Illyria. There, audience members will enter the hotel empire of the classy and sophisticated Olivia. The production will not be without the requisite surfers, wild hotel guests, beach performers and an epic singer…or two. 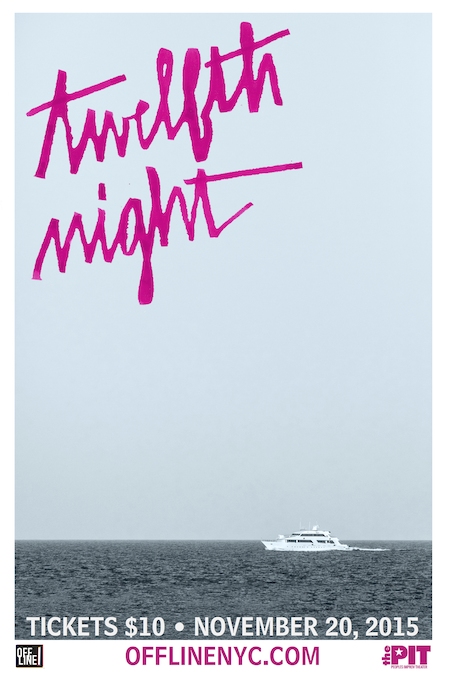 Following the momentum generated by Offline Productions’ successful run of Much Ado About Nothing this past spring, Twelfth Night will be similarly inspired by Alexis Confer’s unique take on the Shakespearean classic. As was the case with Much Ado, Offline Productions promises a uniquely funny, multi-discipline cast of some of NYC’s finest actors, improvisers, stand up comedians, and musical performers. One of Shakespeare’s most beloved comedies, Much Ado About Nothing deals with the quintessential themes of human existence, displaying the absurd lengths we travel in the pursuit of love and honor. The original play takes place in Messina, Italy, but in keeping with our New York roots, we appropriately supplanted the city for a bar in TriBeCa, a neighborhood known as much for its thriving nightlife as for its stroller congested sidewalks. During intermission, audience members had the opportunity to access the bar, and walk about the set, providing an interactive experience that is a defining element of Offline Productions. 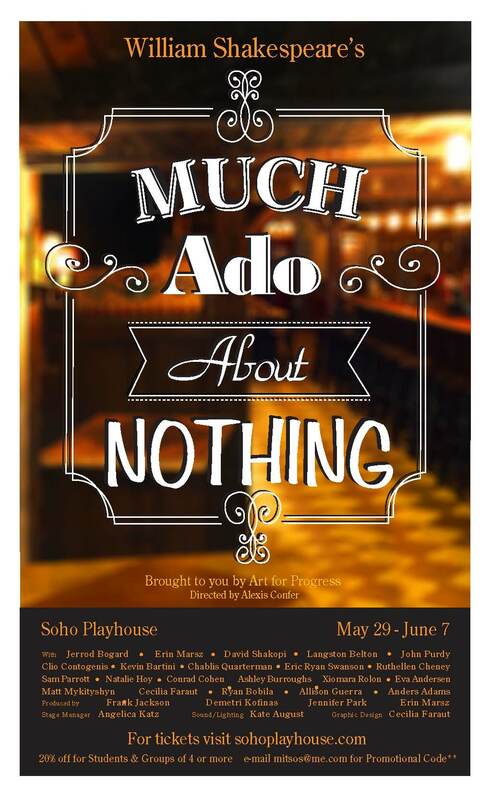 As is the case with all of Offline Production’s theatrical performances, Much Ado About Nothing pulled together some of NYC’s finest actors, comedians, improvisors, and musical performers, creating an electrifying atmosphere of comedic, New York City theater at its best. This was Offline Productions’ first off-Broadway performance, and all profits derived from ticket sales went to Art for Progress’ Arts Education Program, which helps empower NYC’s young artists with the professional tools they need in order to be competitive in today’s markets.